Modern Luxury Media to be Acquired by Dickey Publishing, Inc. - Berkery, Noyes & Co., LLC. Modern Luxury Media to be Acquired by Dickey Publishing, Inc.
ATLANTA, Aug 27, 2010 (BUSINESS WIRE) — Dickey Publishing, Inc. (“Dickey Publishing”) today announced an agreement to acquire the assets of Modern Luxury Media, LLC (“Modern Luxury”), the country’s largest city magazine publisher. Modern Luxury publishes 26 titles in 12 major markets including: New York, Los Angeles, Chicago, San Francisco, Dallas, Houston, Atlanta, Washington DC and Miami. 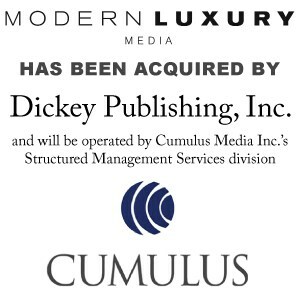 Dickey Publishing has commissioned Cumulus Media, the country’s 2nd largest radio broadcaster, to operate Modern Luxury through Cumulus’ Structured Management Services division. Dickey Publishing has retained Macquarie Capital (USA), Inc. (“Macquarie”) as sole advisor to the transaction. Macquarie also will provide debt and equity funding for the transaction. Berkery, Noyes & Co, LLC represented Modern Luxury in the transaction. Modern Luxury is the country’s largest city magazine publisher, publishing 26 titles in 12 markets — New York, Los Angeles, Chicago, San Francisco, Dallas, Houston, Atlanta, Washington, DC., Miami, San Diego, Orange County and Hawaii. Dickey Publishing, founded in 2000, owns three city magazines in Atlanta including JEZEBEL Magazine, Atlanta Luxury Living; TUXEDO ROAD, Atlanta’s Magazine for Men; and Atlanta Sports & Fitness, an online sports and fitness magazine for health-minded Atlantans. Dickey Publishing is wholly-owned by the Dickey family and is run by President and Publisher, Michael W. Dickey. Macquarie Group is a global provider of banking, financial, advisory, investment and funds management services. Macquarie Capital provides capital markets, advisory and capital solutions and has deep industry expertise in focus sectors including Telecommunications, Media, Entertainment and Technology. For more information, visit www.macquarie.com. Cumulus Media Inc. is the second largest radio broadcaster in the United States based on station count, controlling approximately 345 radio stations in 67 U.S. media markets. In combination with its affiliate, Cumulus Media Partners, LLC, the Company is the fourth largest radio broadcast company in the United States when based on net revenues. The Company’s headquarters are in Atlanta, Georgia, and its web site is www.cumulus.com.